The park is packed full of attractions and activities for all ages. For further details click below. The Family Fun Zone activities are privately operated, running at weekends from St. Patrick's Day to October and daily during July and August (weather permitting). T: 07745 570037 or click here to visit their external website. Under the management of golf professional Matthew Stewart, the driving range offers a range of ways to improve your golfing game. Visitors and locals alike can simply practice on their own or avail of the many opportunities for lessons and coaching. Based at the Activity Centre, Facetastic offers opportunities for young and old alike to have their faces painted professionally or a wide range of temporary tattoos applied! Opening times are weather permitting - click here to visit their external website. The Northern Ireland Survival School (N.I.S.S.) has permission to use Carnfunnock Country Park for certain bushcraft activities. Bushcraft for those who are new to the phrase is a term used for the practice and application of a variety of country life skills. Some of which have their origins in the mists of time others have been passed down through family groups. It has become a pastime for many and an obsession for a few. People like Ray Mears, Les Stroud and Lars Felts, are just some who have carved successful careers travelling teaching and writing about the subject - click here to visit their external website. The Biodiversity Trail incorporates a dedicated fitness trail with 7 pieces of outdoor fitness equipment designed to work various muscle groups in the body. The trail is perfect for beginners and more athletic visitors alike, interested in exercising and promoting good health. Larne Leisure Centre's fitness instructors have also kindly devised suggested workouts, using this equipment. They are suitable for varying abilities i.e. beginner, intermediate and advanced level and are available from the Visitor Centre or free to download below. Persons using the trail should first ensure that they are physically fit to undertake exercise. If in doubt consult your doctor. Use of the equipment / fitness trail is at your own risk and instructions for use, as displayed on all equipment, must be followed. Workouts should only be carried out when ground conditions are safe to do so. Children must be supervised and participants must give way to other park users at all times. There are 3 treasure hunts available for purchase starting at various locations within the Park so make sure you know your starting point! Payment is required in advance before a master copy, along with the appropriate answer sheet, can be given or posted out. As there are no copyright restrictions groups may photocopy this as many times as required. Small amounts of photocopying may be undertaken in the Visitor Centre but you are advised to do this in advance of your arrival as charges will apply. Throughout the year special treasure hunts may take place as part of our events programme. Orienteering is a sport in which individuals find their way from one point to another using only a detailed map, occasionally a compass and their brains! Individuals can proceed at their own pace, which can be anything from a gentle stroll to a vigorous run. Course A: Distance 1.3km. White standard course - Time to complete the course walking 30 minutes. An ideal course for beginners or primary school children with control posts displayed prominently near paths. Visit controls 1, 2, 3, 4, 5, 6 and 7. Course B: Distance 2.6km. Orange standard course - Time to complete the course walking 60 minutes. Visit controls 8, 9, 10, 11, 12, 6, 4, 13, 2 and 1. Course C: Distance 4.2 km. Light green standard course - Time to complete the course walking 90 minutes. This course is for more experienced orienteers requiring navigational techniques to find the control markers and an experienced pair of eyes to read the map. Visit controls 11, 14, 15, 16, 17, 18, 19, 20, 21, 22 and 8. Materials Required: All you need to participate is a map, a clear plastic bag to protect it and a pen or pencil. A clipboard may also be useful. An individual map can be emailed free of charge from the NI Orienteering Association by contacting publicity@niorienteering.org.uk. Alternatively a hard copy can be purchased for £1.70 each from the Visitor Centre (in season) or from the Management Team (off season). Maps cannot be photocopied due to copyright restrictions so groups are advised to laminate them and use appropriate markers. Please note that the orienteering course (and its associated markers) were updated in 2010 and again in 2014. Also available to download from the Northern Ireland Orienteering Association (NIOA) website free of charge. Put simply geocaching is a mix of treasure hunting and orienteering in one go but you have to have a GPS device to take part! There are a number of caches located in Carnfunnock Country Park allowing you to see most of the park main attractions. All cache locations accommodate dog walkers and are accessible from existing paths. Remember to bring along your own GPS device, small gift swaps and a pen to record your details in any of the caches you find. There are lots of international rules governing this interest and so no food items or anything illegal etc. are permitted in the cache. To take part in this unique activity or to report a missing or damaged cache please go to The Official Global GPS Cache Hunt Site. 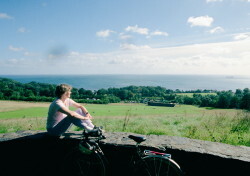 Cycling or mountain biking is not permitted in the park except on main pathways and vehicular roads - this includes staying on the main path within Chaine’s Wood. Bicycles must be ridden with due care and not within pedestrian areas such as the adventure playground, activity centre or visitor centre. Cyclists in the park must proceed with caution, give way to pedestrians and respect other users of the Park. Cyclists must not ride at night and must observe the Parks 5mph speed limit. We also recommend that appropriate safety gear be worn whilst cycling in the Park. Cycle parking is available at the Visitor Centre and Activity Centre. Parents must ensure that children do not leave bicycles lying at the entrance to buildings or activities as this can restrict access for other visitors. This area is perfect for larger groups to play football and other ball games and a range of equipment is also available for hire including tug of war ropes. Mobile BBQs can be hired here by arrangement through the Visitor Centre. There is also a covered BBQ area accommodating up to 150 people. Please note: The Games Field is a shared facility and cannot be booked (except for mobile BBQs and the Covered BBQ area). Larne Parkrun is a FREE weekly 5km event for runners of all standards, which takes place every Saturday at 9:30am in Carnfunnock Country Park, starting from Drains Bay. It is not a race against other runners, but a 5k timed run and it can really be whatever you want it to be, whether that's for fun or as part of a training plan. It offers an opportunity for all the local community, male or female, young or old, to come together on a regular basis to enjoy this beautiful park and get physically active into the bargain. We want to encourage people to jog or run together irrespective of their ability - this event is truly open to all and best of all it really is FREE! Taking part is easy - just register before your first ever parkrun. The great thing is that you only ever need to do this once! Then just set your alarm for Saturday morning and get yourself there! So whether you are a complete novice looking to get yourself started on your own "running journey" or a seasoned athlete wanting to use this as a part of your training schedule, you're welcome to come along and join in. For further information go to Parkrun Larne or click here to check for regular updates on Facebook.